Giving to ARCS Foundation Atlanta assists students of high achievement in science, engineering and medical research. Support for our scholars comes from three sources: member dues, additional member contributions, and generous donations from corporations, foundations and families who believe in the ARCS Foundation mission. All contributions designated for scholar awards go directly to scholar support - ARCS Foundation Atlanta does not retain any portion of donations for administrative expenses. Atlanta Chapter ARCS Scholar Awards are important in recruiting the best scholars to come to the schools that we support. Our scholars are encouraged to stay in Georgia after graduation to explore, innovate, and create, thereby enriching Georgia's scientific ecosystem. 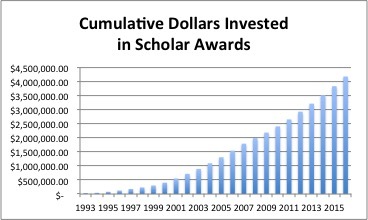 The following charts illustrate the investment that has been made in America's future as a result of the generosity of local corporations, foundations, individuals and ARCS Foundation's Atlanta Chapter membership since it's inception in the early 1990's. Gifts of any size to the Scholar Award Fund support our scholars. 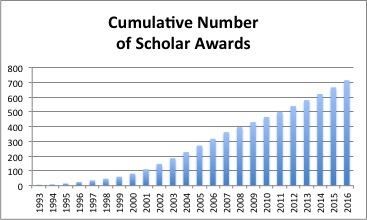 There are also opportunities to fund named scholar awards. Gifts to the Atlanta Chapter Endowment Fund insure the existence of a permanent reserve to support scholar awards for years to come. Corporations and individual donors support ARCS Foundation Atlanta by underwriting the Scholar Awards Luncheon and other activities. Many corporations encourage their associates to contribute to qualifying charitable organizations. A matching gift program offers a way to double contributions to their favorite organization. Contact your employer to determine if they will match your donation to ARCS Foundation Atlanta. Your broker can assist you in making a gift of stock following the Scholar Award Fund donation instructions or the Endowment Fund donation instructions. Contact our Treasurer with any questions. Consider naming ARCS Foundation Atlanta in your estate plan. Contact us for more information. Mail: ARCS Foundation Atlanta, P.O. Box 52124, Atlanta GA 30355. ARCS Foundation Atlanta is a 501(c)(3) corporation. Donors may deduct contributions to ARCS Foundation as provided in Section 170 of the Internal Revenue Code.